Deal or No Deal In It to Win It is the latest DOND themed slot machine doing the rounds in Las Vegas casinos and staring the host Howie, accompanied by the mysterious hidden Banker. Deal or No Deal In It to Win It is a community based DOND slot machine, with a huge main screen for the community action, as well as several individual screens housed on each gaming terminal which provide the basic video reel slot action. 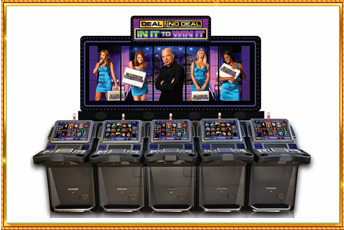 As Deal or No Deal In It to Win It is a community based slot machine, when the main action starts, all active players get to partake in the entertainment on the giant screen, visible to all. The main In It to Win It bonus game is a fairly standard Deal or No Deal concept, with random values hidden within the 18 different briefcases. As you remove the values, the Banker will make an offer at various points during the game, you may then ‘deal’ or ‘no deal’. 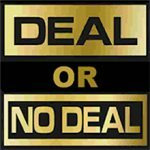 Selecting ‘deal’ will bank the Bankers offer and end the feature, choosing ‘no deal’ will allow the game to continue until you either play to the end, or take an offer further along in the game. Unlike traditional Deal or No Deal, In It to Win It has several bonus features which may be awarded when the Briefcase Bonus is triggered, these bonuses include amongst other things, selecting two cases and a sneak peak allowing for a chance of a greater win. Aside from the main feature game mentioned above, Deal or No Deal In It to Win It has an exciting base game and essentially houses two slot machines in one. At any time during your game you may switch between the Howie game and the Ladies game. Each has the same odds, yet features different reel combinations and various versions of wild symbols to enhance and create winning combinations. The Ladies game uses stacked reels in much the same way as the popular slot machine Golden Goddess. The Howie slot uses a more standard set of reel symbols with expanding wilds. You will likely enjoy one more than the other, so simply switch between them at any time prior to pressing start or entering a feature. Deal or No Deal In It to Win It uses five reels and fifty winlines on stake multiples of a penny, with a maximum prize per game of 4000 credits.